Although I accepted long ago that Dylan doesn’t like parties I decided to throw one for his 21st birthday. Why? I suppose because it is considered a year to celebrate. I can succumb to such suggestion: I don’t like parties either but I marked my 50th when the time came. Once I’d decided to hold an event I was faced with the questions what and where. Dylan had enjoyed a friend’s ‘at home’ party recently but this wouldn’t work for Dylan who retreats to his bedroom if we have visitors. A Disney movie at Dylan’s favourite cinema would go down a treat with Dylan but wouldn’t be anything out of the ordinary or to everyone’s taste. An ice-skating party would also delight Dylan but would exclude others – and although pleasing Dylan and his peers was important, most of the guests would be adults who had supported us over the years. In the end I settled on a tea party with music and dancing at the Yorkshire Sculpture Park. The park is one of Dylan’s favourite places and somewhere he has visited since he was a baby in a backpack. The combination of earth, sky and stone is magical and has brought us peaceful healing at times of grief as well as much joy. Happily, a room in the visitor centre appeared perfect for Dylan’s party: clear boundaries, white walls, natural light, good acoustics, and a lobby and annex for timeouts. While the room and venue seemed ideal I was concerned that Dylan already associated the park with a particular routine; a trip there involves a two hour hike around the perimeter before a switchback past the lake and refreshments at the visitor centre. Would Dylan accept a visit for a different purpose? There was a possibility, I reflected, that he might not get to his party on the day. Taking Dylan to see the room reassured me he would walk down a corridor we didn’t usually use and allowed me to photograph him for a social story. Another way I tried to prepare Dylan was to involve him in sending out invitations. While Dylan might not connect sticking stamps on envelopes with a party, the activity provided an opportunity for me to talk to him about the event. Dylan understands the words ‘birthday’, ‘balloon’, ‘cake’, ‘music’, ‘dancing’ and ‘presents’ so I repeated these while pointing to the invitation and naming his guests. How Dylan would cope with the guest list I had drawn up was another of my worries. I had envisaged the party as a celebration of Dylan’s life so it was important to me that I invited people who had supported him in the past. This meant that the guest list included care workers and PAs, childminders and neighbours as well as family friends and young people with autism. Some of the guests had provided support to me, rather than directly to Dylan, so he knew them less well. Others have a special role in our lives – two friends who are Dylan’s trustees for example. What would be the impact on Dylan of bringing together these various people from different contexts? And what sense would he make of absences? If someone who Dylan hadn’t seen since 2006 appeared, would he expect his Gran (who died that year) to walk through the door as well? Two people who would be out of context at the party were J and A, care workers at Dylan’s day centre. I would, I realised on the run up to the party, find it difficult to manage the event while supervising Dylan who requires 1:1 support at all times and 2:1 support in the community. As a single parent I cannot provide this so I continually run (sometimes erroneously calculated) risks; such hazarding at a party for 35 guests was not, I realised, a good idea. Fortunately J and A, who know Dylan and have a good relationship with him, agreed to work the party. Having PA support for Dylan was an enormous help and freed me to spend time with Dylan’s guests. It also had an impact on how Dylan spent his time however; while untroubled by J and A being out of context, Dylan stuck very close to them. I wondered if this was Dylan’s way of managing an event which brought together multiple contexts; rather than move between them, he opted for the clarity of a familiar relationship. This definitely seemed to help Dylan to settle and as the party progressed he moved around the room more independently. Although I was glad to have the PA support, it did mean a certain ‘loss’ of Dylan on the day (though I would have experienced other losses had I been supporting him myself). It was Dylan’s party though, not mine; the important thing was that he was happy. And everyone agreed that Dylan seemed to be having a magnificent time; by the end of it, he was up on stage, high kicking to the music. Dylan chose the music for the party which included a Blues compilation, Hozier, Adele, Sam Smith and Florence and the Machine. Giving Dylan control of the music was a way of engaging him in the event and creating a sense of ownership. It was also important because Dylan uses music to ‘screen out’ sound, smells and touch which he finds uncomfortable. Playing familiar music, I hoped, would help Dylan to cope with sensory aspects of the party which he found disturbing. I knew that chief among the environmental disturbance for Dylan would be us, his guests. Always ambivalent about human interaction, Dylan can range from seeking contact with others to pushing them away. Although I can’t always work out his reasons, some things I know. Dylan, for example, doesn’t like loud voices; shrill voices; excited voices; quick voices; tears; sudden movements; uninvited touch or eye contact. I know this because I am guilty of an awful lot of things on that list. Some people find it quite natural to adopt a manner which Dylan finds comfortable but I’m not one of them; I have to work hard at being the sort of person who Dylan can cope with. Because I know that I am many of the things which Dylan finds difficult I assume that I also have the potential to irritate and disturb other autistic people. And if an irritated autistic person goes into ‘meltdown’ then there can be a domino effect where other autistic people in the vicinity become distressed. I know that this is true of Dylan who becomes very anxious if one of his peers gets shouty or disturbed. The music which helped Dylan to feel comfortable was, of course, just as likely to cause discomfort to someone else. But at his own party Dylan was allowed to make his own noise and quick movements 🙂 He was also permitted (for one day only) to eat three pieces of cake. I’m not sure I would have allowed this but it was one of the advantages for Dylan of being supported by PAs rather than low-sugar mummy. But perhaps I’m just envious; by the time I went to find myself a piece of his cake there was none left. I’m not surprised that Dylan went back for more; the ‘number 2′ was his Never land sponge. A silhouette of a city skyline (to represent the Darlings’ London) was iced around the edge of the cake with Peter Pan standing on top and ‘never grow up’ inscribed down the 2’s curve. The ‘number 1’ , meanwhile, was a fruit cake with a seascape around the edge and Dylan’s beloved Ariel on top; this cake carried the inscription ‘a part of our world’. Creating a coherent design out of two characters was the source of such anxiety that in the end I opted for simplicity and hoped that the cakes would at least taste good. Unfortunately this strategy didn’t work so well for the buffet. Conscious of the need to cater for Dylan I asked for the afternoon tea menu to be simplified. Could we have some sandwiches without garnishes and condiments please? And could two of the sandwich options be on white bread? And could we perhaps have some vegetarian sausages, even though not traditionally part of afternoon tea? What I hadn’t anticipated, when I requested this autism-friendly food, was just how beige the whole thing would look. It can be hard to make plain food look appealing and nothing on the table tempted me (or, judging by the leftovers, others). I got home from the party feeling hungry. I had thought food might be an important way of helping Dylan to manage the event but on reflection I should have ordered it to please Dylan’s guests rather than to suit Dylan – particularly because, as it turned out, Dylan was far too busy opening presents to bother much with the buffet. For after refusing to open his presents all day, Dylan suddenly decided that he knew exactly what to do with them. It’s probably true to say that Dylan greeted his presents arriving rather than his guests; he tore off paper at high speed, leaving his PAs to juggle wrappings and gifts into separate bags (which they did brilliantly). I had little idea, afterwards, who had given what to Dylan. I was sorry that I hadn’t taken the opportunity to thank people more carefully on the day; I had, after all, had the perfect opportunity while Dylan was pouring the wine. I’d asked Dylan’s PAs to support Dylan to go round the room with a bottle of bubbly, filling glasses for a toast. I was pretty sure this would engage Dylan as I’d watched him pouring wine for people at a friend’s party. I thought this might be a good way of encouraging Dylan to interact with his guests. Although I’d thought that Dylan pouring the wine would give me a perfect opportunity to say a few words, I was too preoccupied with how the pouring was going to focus. Perhaps, on reflection, I should have helped Dylan with the wine as that would have helped me to interact as well 🙂 As far as I could tell, however, Dylan filled up glasses beautifully; the only thing that went awry was when, searching for an alternative to singing Happy Birthday (which Dylan doesn’t like), I proposed Three Cheers which one of Dylan’s guests didn’t like. But the greatest hit with Dylan was probably not the wine or music or the dancing or cake, or even the presents, but a slideshow of his life I had put together. From time to time I would see Dylan glance up at the wall where the images were projected and smile. I suppose, given the importance of the visual world to Dylan, it’s not a surprise that this would appeal. Dylan’s guests also had reason to look up from time to time; a challenge I’d set myself, when putting the slideshow together, was to include photos of as many people at the party as possible. One such photograph was of Dylan at a friend’s 50th birthday party. Could I email a copy to him at some point? my friend’s husband asked; his mother-in-law (who had since died) was in the frame. His request reminded me that I had something of my mum with me; I had brought (thinking I might read it) a blessing for Dylan which she wrote before she died. Wherever there are gatherings there are absences. Sometimes, though, it is in the spaces that we find our celebrations. I enjoyed the party but my special moment was before people arrived, almost alone in the room with Dylan, dancing to Paper Moon. As we danced, a photo of my mum ghosted onto the wall: Look Dylan, I said, your Gran. I had in mind to make an album of the party for Dylan but for one reason and another didn’t take any photographs on the day. It is my biggest disappointment 😦 A big thank you to Bill, Bryony and Caroline for these. The photos of baby Dylan and his Gran and of big Dylan checking out the party venue are by me. The photograph of me and baby Dylan at YSP was taken by my ex-husband. The cake design and invitation are by me and my daughter. The Hozier album cover image is from Wikipedia. In this post I provide examples of Dylan’s home-based learning within each of these categories. Although Aboucher and Desforges’ framework is not based on a specialist learning environment I think it is equally applicable for an autistic child with a learning disability. As the examples illustrate, however, flexibility is required when interpreting the categories. Although Dylan doesn’t ‘read’ he has always loved books. Below are some ways in which Dylan engages with literacy-based activities and my reflections on their possible value. Reading the same book for weeks on end. I used to try and move Dylan on to other texts but later realised that this repetition suits Dylan’s learning style and builds his confidence. Reading multiple copies of the same book. I have speculated on possible reasons for this here. Reading the same page in a particular book. Dylan keeps favourite books open at ‘special pages’. At home he keeps these close at meal time and bath time. I imagine that these pages are comforters for Dylan or that the characters on the page are real to him and are his friends, sharing Dylan’s key activities. Turning the pages of a book rapidly, usually from back to front, sometimes while looking away or with eyes closed. I imagine Dylan might be counting or playing memory games. Carrying books around without opening or looking at them. There are eight books which go everywhere with Dylan. Dylan doesn’t look at these outside the house; sometimes, when we are in a cafe, I might say ‘why don’t you have a look at one of your books Dylan?’ But he never wants to. Dylan has the books with him not as we might, in order to read at opportune moments, but as comforters perhaps, or because they are friends, or he enjoys their weight. Using books as objects, for example to sit on, lick, or wear on the head. Dylan’s sensory and physical relationship with books as artefacts is a valuable part of his developing literacy. Dylan accepts my standards of care for library books, I think, because he has his own copy of favourite books (which I accept will become wet, dirty and torn). Reading homemade books. These can be quite simple: scrapbooks, for example, laminated pages or inserts in plastic sleeves of an A4 folder. The books can have a narrative arc (for example ‘using the toilet’) but more often the books I made for Dylan were simply pages of things which I thought would interest him. ~ memorising some of Dylan’s favourite books and speaking these to Dylan at various times of day. In time this triggered him to fetch the book. There are now a few books which Dylan will allow me to read with him. It is always important, however, that I let Dylan take the lead, e.g. selecting the text and setting the pace for me to read as he turns the pages. Numbers and letters are abstract symbols. Some children with an autistic spectrum condition are comfortable with this and demonstrate a facility for mathematics or for learning foreign languages. This is not the case for Dylan, however, for whom numbers and letters as symbols have never appeared meaningful. At 20 Dylan will identify marks on a page as ‘why-ya’ (writing). He will also tell me that I am ‘why-ya’ if he sees me with a pen or pencil and piece of paper. Interestingly, however, if I am typing at a keyboard he will not identify this as ‘why-ya’ but rather ‘poo’ (computer) which he sees as a different activity entirely. I’m not sure if Dylan connects letters with communication (i.e. whether or not he understands the link between reading and writing). I am even less sure that Dylan associates number symbols (1,2,3 etc) with the thing(s) they represent. Dylan doesn’t have a word for ‘numbers’ and hasn’t ever told me that a symbol is a ‘number’ in the way that he has identified marks on a page as ‘why-ya’. I suspect that, for Dylan, numbers and letters amount to the same thing: abstract marks on a page. Counting things in pictures (the windows in Ulm cathedral is a favourite activity) through chant and point. Whenever Dylan pays attention to something I look for objects we can count, e.g. ‘let’s count the stars’. Playing dominoes (this may be more about matching the shape of the dots than about number but I try to enforce the number link by counting dots when we play). Focusing on meaningful sequences of numbers and letters rather than abstract sequences such as the alphabet. The sequences of letters which Dylan recognises currently are D-y-l-a-n and (possibly) m-u-m. It has taken many years of exposure to the letters in Dylan’s name for him to recognise them. Even now I don’t think that Dylan ‘reads’ his name; he likes pointing to the letters on his door and for me to chant them, but he is as likely to indicate them in reverse order (but get cross if I sound them out backwards). Gradually replacing familiar pictures with letter sequences. I tried doing this as part of Dylan’s home learning programme by blanking out some of the pictures in his ‘red book’ and in lotto games. On reflection I tried this too early. I should have allowed more time for Dylan to feel confident communicating with photographs, pictures and symbols before moving him onto letters. Attempting letters too early created a sense of failure in Dylan and frustration in me (or perhaps vice-versa). My sense is that Dylan is only now moving into the symbolic stage of communication; I have had some success this year with makaton signs and symbols and have therefore recently introduced the sequence m-u-m. Introducing numbers and letters in a naturalistic and comfortable setting. I have introduced m-u-m on Dylan’s visual timetable board because it’s an object which is important to him, that he is comfortable with, and which he interacts with on a daily basis. For other children and adults this might be DVDs, i-pads, the fridge door etc. While technology supports some children to develop an awareness of numbers and letters, Dylan doesn’t seem to recognise word processed text or screen-based letters and numbers. Dylan’s learning style is kinaesthetic; he needs to hold a physical letter or number in his hand and engage with it as an object. For learners like Dylan, play letters and numbers are important for years beyond what might be considered ‘age-appropriate’. I did ‘shape work’ with Dylan as part of his home learning programme but am fairly confident that he still doesn’t recognise the words ‘square’, ‘circle’ or ‘triangle’. And who cares? Is it going to make his life any less rich? Does it matter if he doesn’t know the word to describe a shape? 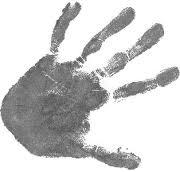 As with letters and numbers, Dylan needs a physical object in his hand to recognise the shape of it. I’m sure that he has an intimate understanding of a triangle; if I put one in his hand he would explore it with all his senses (especially if it was a piece of Toblerone). But he wouldn’t recognise the name for it. And he wouldn’t push it into a ‘shape sorter’ with any enthusiasm or success. In fact I used to think Dylan tried to push shapes into the wrong holes deliberately, for a laugh. Matching games. It is easy to make lotto games of objects which your child is particularly interested in or of new vocabulary which you want to teach. While this isn’t about ‘shape’ as such, it is about pattern recognition which involves the same cognitive processes. Flash cards. A deck of cards is tactile and comforting; you can shuffle, sort, browse, deal, distribute, drop, pick-up, check, lose, duplicate and throw away. So many wonderful possibilities. Dylan liked cards. I probably didn’t exploit this interest as much as I could have. Found shapes. As a writer I love to stumble on poems which exist without having been written: the found poems we encounter if we keep our hearts and minds open. And shapes are even easier to find than poems; food is a great place to look (I’ve already mentioned Toblerone) as is the great outdoors. I am currently working on pointing shapes out to Dylan in the hope he might make the links between them and recognise the abstract concept of ‘triangle’ as something which applies equally to a piece of chocolate and a road sign. Some of Dylan’s most effective exposure to language has been through musical resources; I suspect this is because nursery rhymes and songs use devices such as chorus and repetition which create the pattern and structure which Dylan responds to. Although Dylan has an ambiguous relationship with singing due to his auditory sensitivity (I have written about this here and here) music has been one of the most important things in his life and seems increasingly significant as he gets older. ‘Embodying’ nursery rhymes through actions: some of Dylan’s favourite nursery rhymes, and the ones he seems to learn most from, are those with accompanying actions. Exaggerating actions to nursery rhymes in order to emphasise communicative purpose. Making changes to the words of familiar nursery rhymes so that Dylan accesses meaning as well as sound. My daughter, for example, changed ‘one potato, two potato’ into ‘one banana, two banana’ one day, changing the shape of her hand from a fist to a flat curve. Dylan found this hilarious and still enjoys changing potato to banana. Exaggerating singing of nursery rhymes in order to emphasise features of language such as stress, intonation, tone and pitch. What makes the education system fundamentally inaccessible for many children is the role of language in the delivery of the curriculum. A key challenge for parents and educators is therefore how to make learning accessible for children who do not speak or use an alternative communication system. Dylan is currently developing some echolalic speech but for the majority of his life, and throughout his schooling, has been classed as ‘non-verbal’. It is perhaps not surprising that so many of the suggestions in this post focus on language development; it is in its potential for adaptations to language, I suspect, that a home learning programme may be of particular value. The images of Owl Babies and the Toblerones are from Wikipedia. The opening photograph of Dylan reading Postman Pat was taken during a holiday in France in the late 90s, at the time of Dylan’s home education programme. The closing photograph of Dylan at a climbing centre (holding a copy of Pinocchio) was taken just before Christmas 2014. Dylan loves music; assembly causes Dylan distress; Dylan responds well to music; Dylan is not comfortable in music sessions; Dylan enjoys listening to CDs; Dylan covers his ears. In this post I speculate on the reasons for Dylan’s apparently contradictory response to music. I also discuss seven songs – selected by Dylan – and reflect on some ways in which these choices might help to illustrate his relationship with music. In a previous post I have written about auditory sensitivity in autism and some of the therapeutic interventions which can be made. Dylan undoubtedly experiences auditory discomfort; he often clamps his right arm over his head, his upper arm held tightly against his right ear and a finger pushed into his left ear. This is canny: as Dylan is left handed it leaves his strong arm free to pull whoever is supporting him out of the situation causing him distress. As well as being disturbed by a range of environmental sounds (children crying, dogs barking, motorbikes) it is possible that Dylan hears frequencies most of us cannot; the idea that Dylan hears in ultrasound underpins my poem sequence The Bat Detector, for example. I suspect that ‘deep’ background noise (such as heating systems, underground streams and sap through trees) is also audible to Dylan. Other autistic people have reported similar disturbance; some have posted clips on youtube which simulate this experience. Watching these videos is an uncomfortable experience and has helped me to comprehend just how powerful Dylan’s auditory disturbance may be. This hypersensitivity may, I suspect, explain both the pleasure and the pain which Dylan can find in music. It is possible, I think, that this backdrop of environmental noise reduces the clarity of music in the same way that it interferes with Dylan’s processing of spoken language. Dylan may find music as uncomfortable as language in certain contexts (busy and open spaces, such as assembly halls, for example). Conversely, some environments may be particularly comfortable places for processing music. I’ve noticed, for example, that Dylan enjoys listening to music in the car. 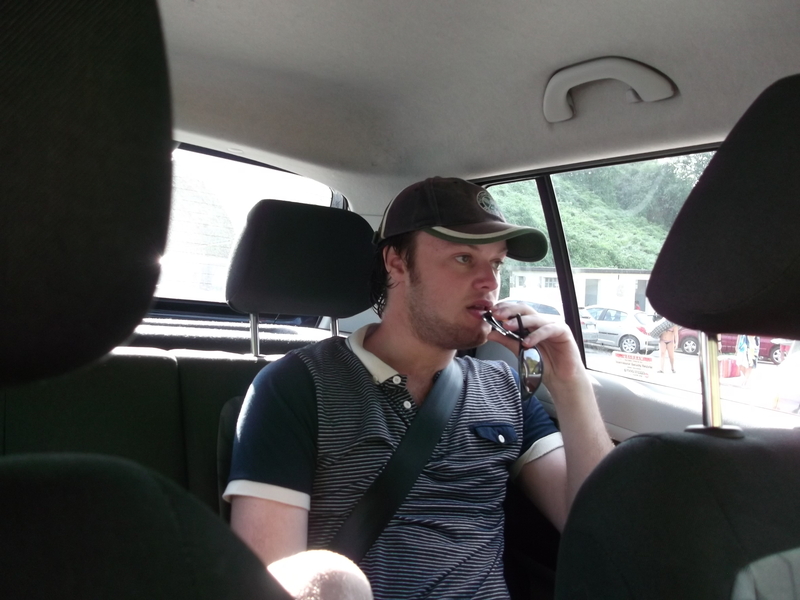 While some songs still cause him discomfort, the interior of a car seems to be good for listening. This also seems to be a useful space for Dylan to process language; he often extracts meaning from language more easily in the car. Perhaps the very features of private transport we complain about (sealed and isolated from others) are helpful to Dylan. The ultimate privacy in listening is via headphones. In a previous post I’ve written about the use of headphones to block or clear out background noise, for example via auditory integration therapy. Until he was a teenager the only music which Dylan would listen to (with one exception which I’ll return to) was nursery rhyme audio tapes. When I persuaded him to accept a nursery rhyme CD my daughter offered to put it on an i-pod shuffle for Dylan. This created challenge as well as possibility. Although we could now use music to lessen Dylan’s discomfort in the community, if we didn’t get the choice of music right it would have the opposite effect: delivering music which Dylan found painful directly into his ears was far worse than an uncomfortable environment. Don’t put anything on there your brother doesn’t like or know already, I instructed my daughter. 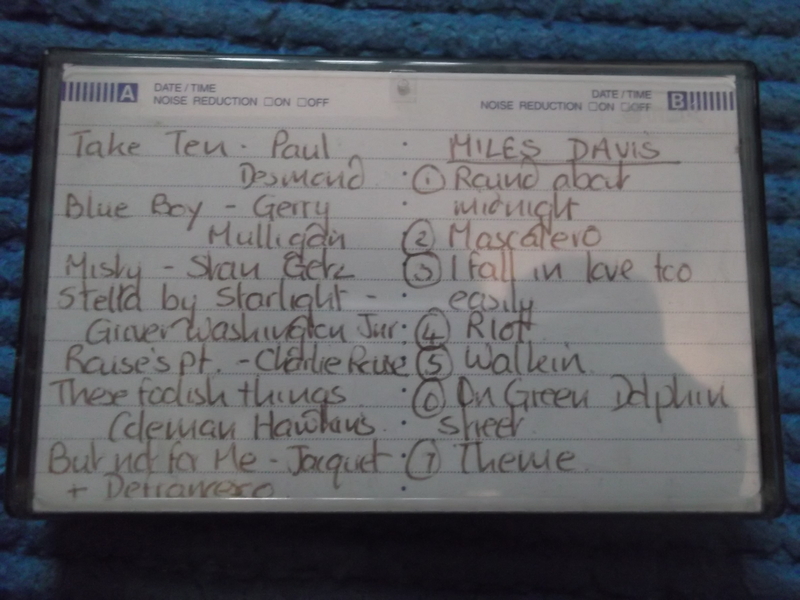 I would discover her sneaky inclusions on the ipod from time to time as Dylan pulled the ear buds out and let me listen in (usually to a french pop song). One of the introductions my daughter made was crucial, however, in moving Dylan away from nursery rhymes; she had noticed his interest in one of my CDs and put this onto his shuffle. When Dylan first started to bring me the CD (a collaboration between Elvis Costello and Anne Sofie Von Otter) I thought he was anticipating my behaviour rather than expressing a preference of his own. Later I would realise that it wasn’t that Dylan thought I wanted to listen to it but that he did. Dylan now has this album on CD, i-pod shuffle and i-pad. Is it possible, through this album, to identify the features of music which bring Dylan particular joy? Part of Dylan’s hypersensitive hearing involves a discriminating ear; I believe he has perfect pitch. Dylan cannot bear the sound of school and amateur choirs. He finds music played through poor equipment painful. He cannot endure piped music through public address systems. This may be partly due to the background noise of electronic equipment but I have seen Dylan react with equal discomfort to poorly pitched acoustic music and a capella singing. Many of Dylan’s musical choices may therefore be determined by the quality of sound; I’m sure the fact Von Otter is classically trained has a bearing on Dylan’s experience. It isn’t just about pitch though; Dylan may also have particular key preferences. When Dylan was very young a musicologist, having observed Dylan’s engagement with music one evening declared: I think it’s Eb and Bb he likes – the language of the blues. Over the years I’ve seen this hunch borne out. 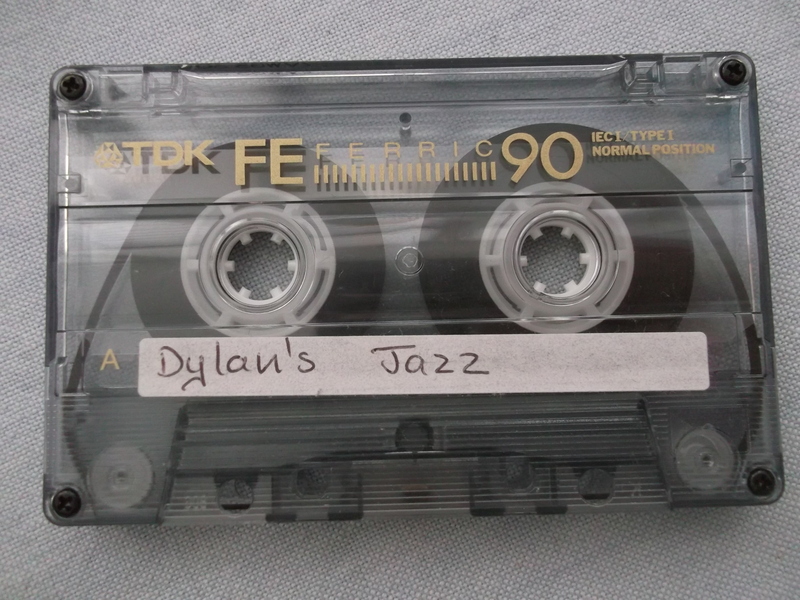 Although at home Dylan only listened to nursery rhymes, at primary school he had a jazz blues tape which one of the teachers made for him and which Dylan listened to if he became anxious during the school day. 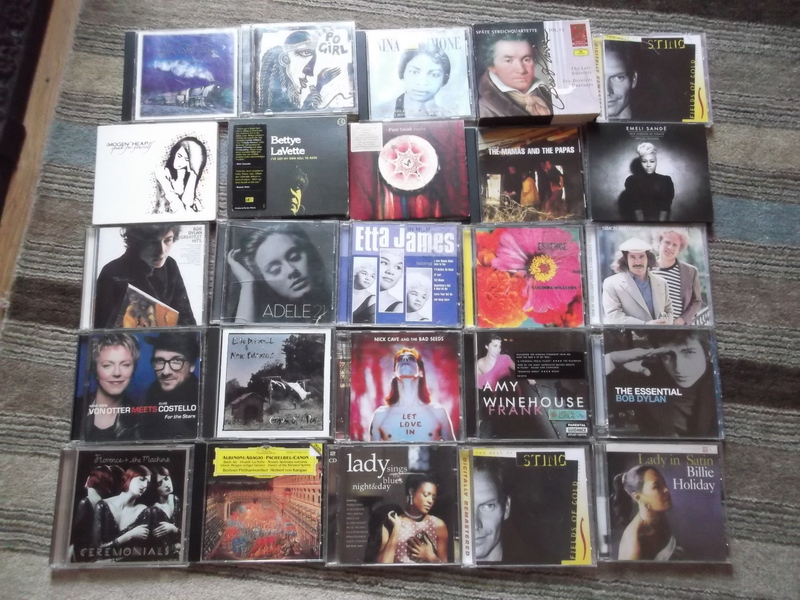 Among Dylan’s favourite CDs today (though not making it into his final seven) are Bettye LaVette, Nina Simone, Etta James and Ella Fitzgerald. There have been a number of cases over the years of autistic children and adults with extraordinary musical talent. This sits quite comfortably in my mind with the gift for number which some autistic people demonstrate; music and mathematics share the same underlying structures. For these purposes, however, I want to focus on people such as Dylan who don’t show any obvious musical gift; while I’ve seen Dylan pick up a pair of drumsticks and keep effortless time, he doesn’t play an instrument. At home he lets me play piano and recorder but draws the line at harmonica; his arm clamps quickly across his head if I so much as pick it up. Over the last year my Dylan has discovered that he loves to dance. Every evening he chooses some music then holds his arms out to me. When I say ‘dance’ I should qualify this: it is spinning rather than dancing. Dylan takes you by the arms and with his eyes closed he spins clockwise as fast as you are prepared to accompany him. I have never known him become dizzy; he would spin all night if I let him. Every trick I try I cannot last more than one song. It ends with me clutching the table: I’m sorry Dylan mummy’s dizzy. This, then, is music as sensory pleasure: choose a singer with perfect pitch; give her the Ebs and Bbs; lay down a rhythm; and spin, spin, spin. One of the distinctive features of jazz and blues is syncopation. Syncopation refers to the interruption of expected rhythmic patterns; instead of the beat our ear expects (based on the rhythm already established within a piece) we encounter variety. Miles Hoffman explains this as “a disturbance or interruption of the regular flow of rhythm” through a “placement of rhythmic stresses or accents where they wouldn’t normally occur.” (Hoffman, 1997). Given that autistic people are believed to favour the expected over the unexpected, an enjoyment of syncopation may appear a surprising feature of Dylan’s engagement with the language of music. If the brain evolved for the purpose of speech, it’s odd that it evolved to a capacity way beyond speech…I have reason to suspect that the auditory brain may have been designed to hear music and speech is a happy byproduct. While Dylan’s interest in jazz rhythms may be underpinned by structure and syntax, his song choices also suggest a role for semantics. As well as the technical issues of acoustics, rhythm, pitch and key, Dylan’s engagement with music appears to be emotional. Just as you and I might associate a particular song with happy or sad times, so Dylan seems to have mapped some of his strongest memories on to music. 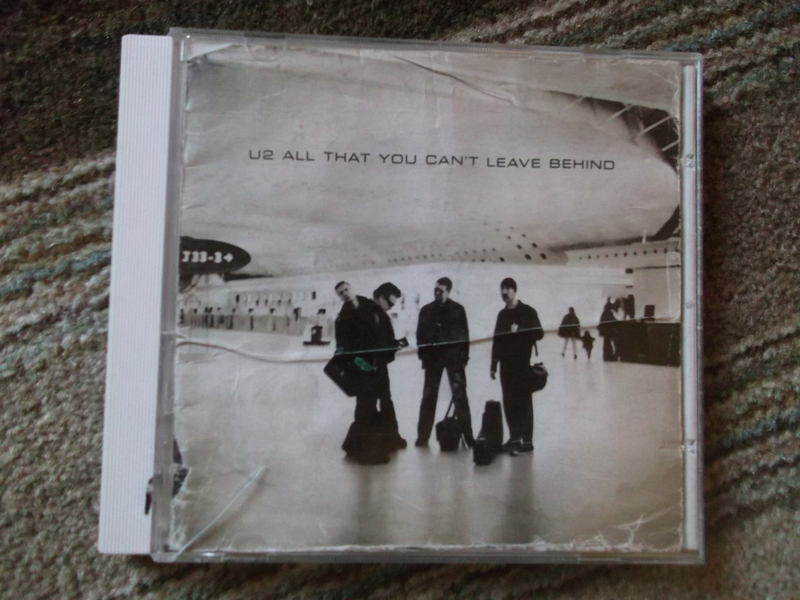 Only recently have I realised that his refusal to listen to this U2 CD is probably because my ex-husband and I were listening to it at a crucial time in the breakdown of our marriage. Sometimes I cannot work out what the associated memory might be but I’m sure it is there; a Tears for Fears cover we are not able to listen to on a Patti Smith album for example. 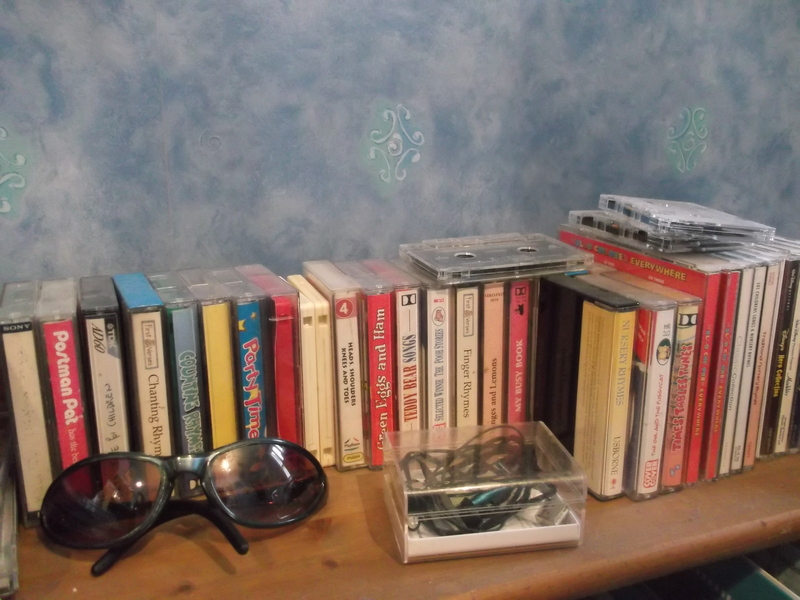 When Dylan started taking an interest in music I decided to help him build his own music collection. He only ever buys duplicate copies of my CDs, however. To try and extend Dylan I have bought him different CDs by artists he already knows but if he doesn’t recognise the covers he won’t play them. For Dylan, visual information is an important part of his engagement with music. 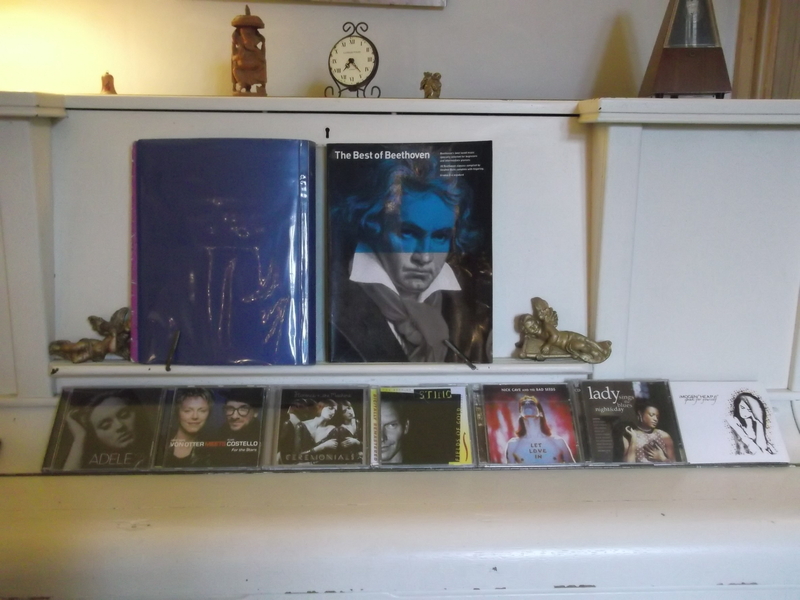 This means that Dylan’s seven songs are derived from my collection; his individual preferences are, nonetheless, apparent from the music he chooses. Some of the songs have particularly happy emotional associations for him I think; I’m not sure why he likes others but it could be the rhythm, key or quality of sound. I say a few words about what I think may inform Dylan’s selections. To support Dylan to make his choices I spread a long list of his favourite CDs on the floor (prompting Dylan to add to and subtract from these). I would have said Adele 21 was Dylan’s favourite CD so I think this is a secure top spot placing. 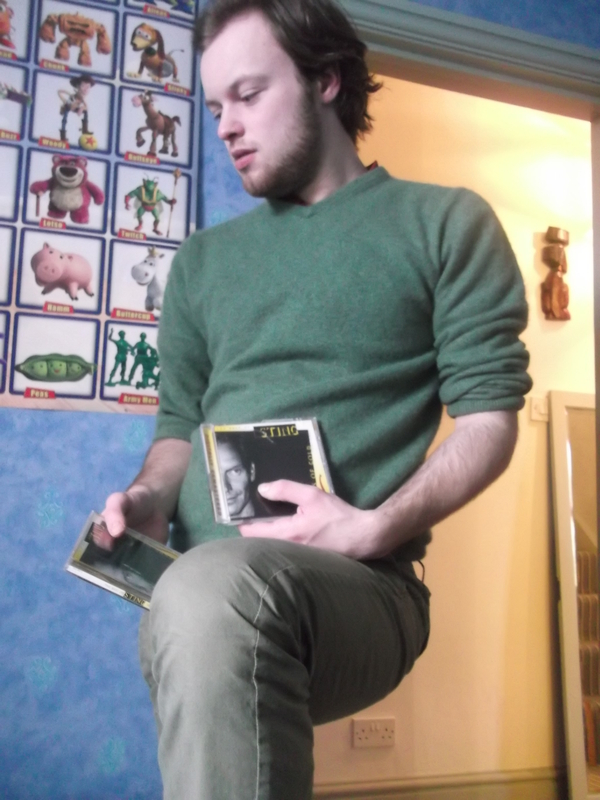 I suspect that Dylan already knew the album before I acquired it; perhaps he had heard it on the school bus. Dylan particularly likes dancing to Adele. I think he likes all the tracks on the album; I’ve hazarded on this one. 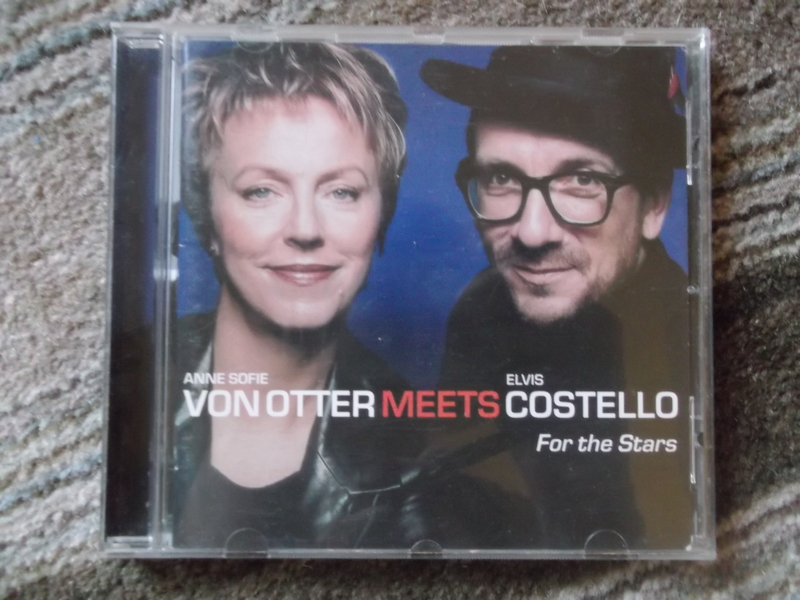 Costello and Von Otter’s For The Stars was the first CD Dylan took an interest in. I think he likes the quality of Von Otter’s voice. Like an Angel is a trance-inducing song for Dylan; he can seem close to ecstasy when listening to it. Mashee Dylan says to me, Mashee. That’s also what he calls treadmills and cross-trainers; I sometimes wonder what sense Dylan makes of a CD having the same name as the kit in the gym. Perhaps it amuses him. I am a bit surprised Dylan put Florence in 3rd place but I can see why he’d like her voice and the use of orchestral music. 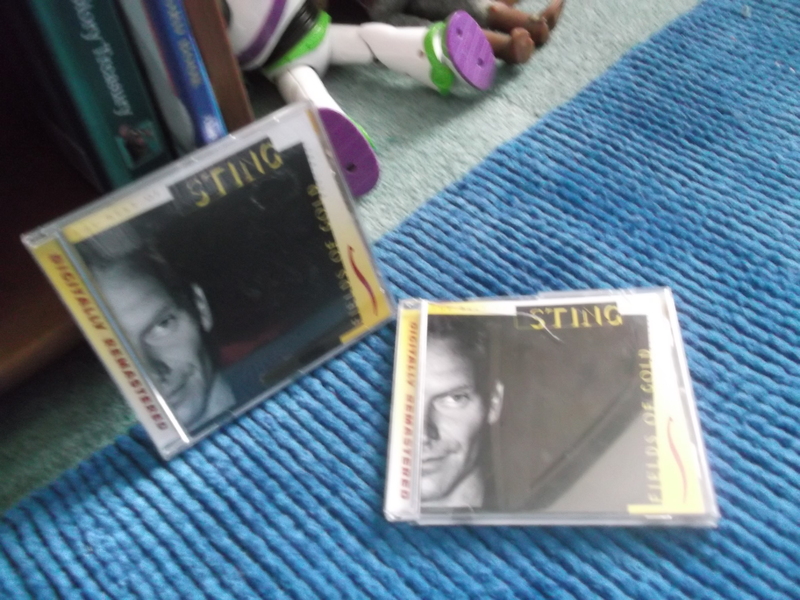 My ex-husband was a fan of Sting and used to play this album a lot. I have a memory of him dancing to it with Dylan in his arms. 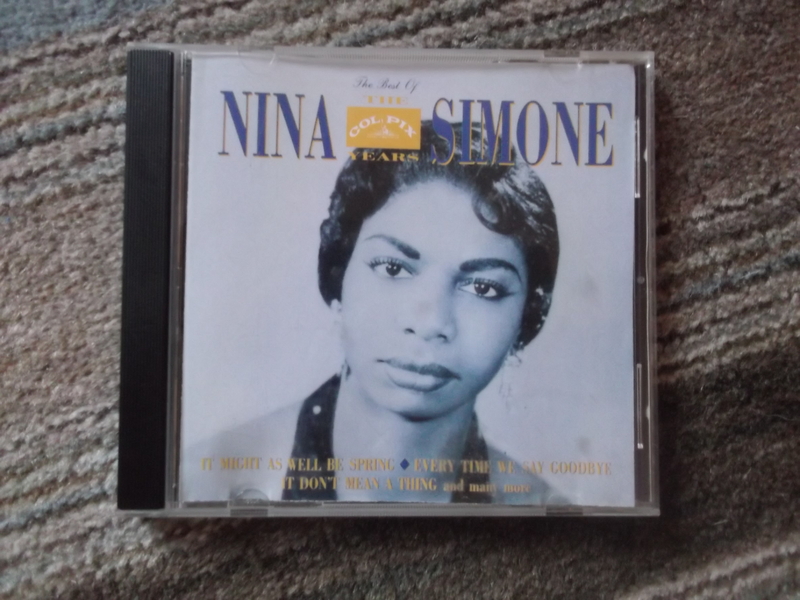 I bought this CD for myself quite recently after a song on the radio jogged my memory. I was surprised by the way Dylan immediately claimed it and bought a duplicate copy plus a copy for his i-pad. I think he may have a deep memory of dancing with the man he knew for years as his dad. Dylan pulled Let Love In off my shelves recently and wanted me to play it. Since then he has been very attached to this album. I’m not sure why but, again, I wonder whether it is a deep memory of my ex-husband who used to play this album. Dylan was insistent that this was the youtube clip he wanted me to use. Dylan included a compilation CD of women blues singers in his top seven: lady sings the blues night & day. I’m not sure if he has a favourite song from the collection but I think he’s happy with this one; when I set the clip playing he came running to look. Dylan likes me to play this compilation CD. I think he associates it with good times and dancing. I don’t know why Dylan is so attached to Imogen Heap’s album Speak for Yourself. I bought the CD in 2012 after this song was played at the funeral of a friend. It has no connection for Dylan yet this is the song he seems to particularly like. My ex-stepdaughter is called Imogen and I have sometimes wondered if this might explain Dylan’s attachment to the CD; he certainly likes me naming it. Imogen Heap, I say, it’s Imogen Heap. Leep he laughs, Leep. Adrienne LaFrance (2014) ‘How Brains See Music As Language’ in The Atlantic. I developed an interest in ‘the double’ years before Dylan was born. As well as enjoying double narratives in literature and mythology I was fascinated by twins. For a while I thought I had a twin pregnancy while I was carrying Dylan and my husband and I used to refer to our daughter as ‘the twins’ (in utero and out) although we knew from a scan that she was a singleton. 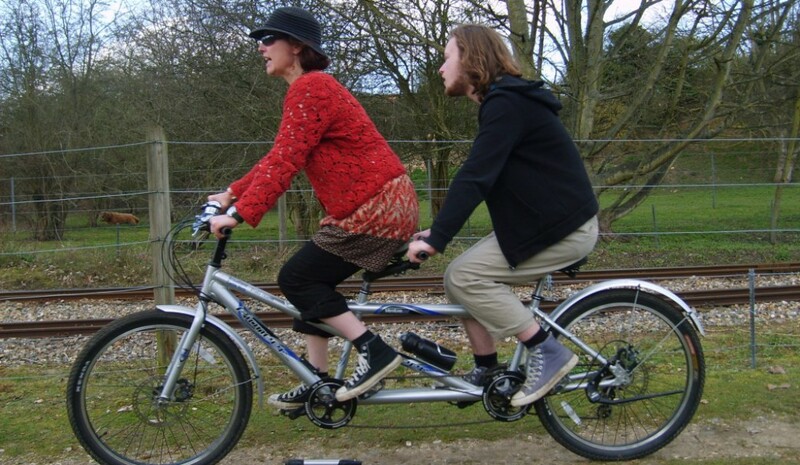 Soon after my children were born I came across a study of handedness and pregnancy; left-handed people, the study proposed, could be ‘surviving twins’. According to this theory a significant number of pregnancies begin as multiple pregnancies but in the early weeks, undetected by us, one of the embryos fails. The impact on the surviving twin of hormone levels in the womb, the research suggests, manifests itself through handedness. Both my children are left-handed although neither I nor their fathers are, and I have sometimes wondered to myself whether they are surviving twins. I’m not aware of any research looking specifically at handedness in autism but it would be interesting to know if the incidence of left-handedness in the autistic population is higher than in the general population (I’ve mused on this issue previously in relation to visual and linguistic processing here). If it were the case then I can imagine that ‘surviving twin syndrome’ could be an interesting line of enquiry as part of research into the biochemistry of autistic neurology. I’ve been thinking about the double recently while pondering one of Dylan’s behaviours which I call ‘Doing the Two’s’. This happened most recently last weekend when I took Dylan to a music shop to choose a new CD. 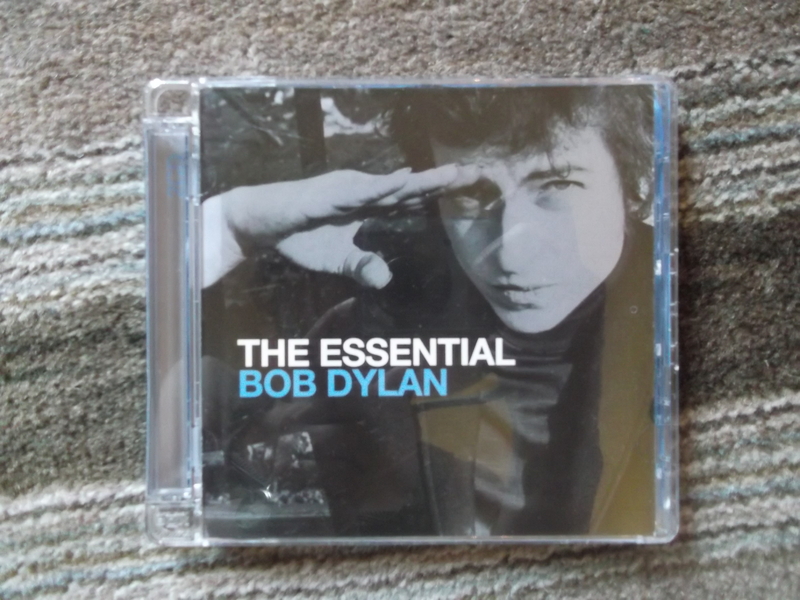 I usually buy music, films and books for Dylan online because I know what is likely to happen if I give him a choice in a shop – and, indeed this is what happened on Saturday. 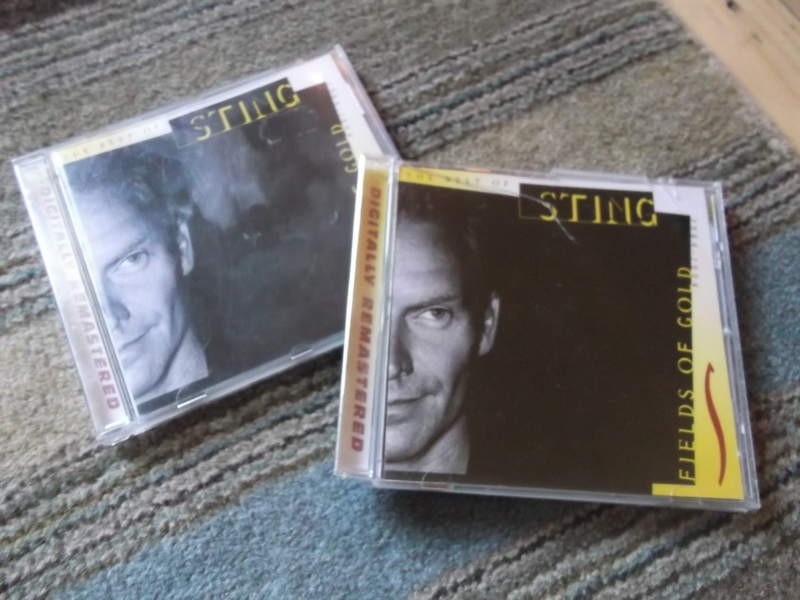 Dylan loves Sting’s Fields of Gold but, as you can see, he already has a copy. He also has the album on his i-pad so this is actually his third copy of the CD. The shop I took Dylan to is a music-lover’s paradise with rows and rows of stock but Dylan somehow managed to locate the Sting CD and all my attempts to divert with other suggestions failed. I wouldn’t always give in to Dylan’s desire to buy a duplicate of something but on this particular day, for a variety of reasons, I did. I have been having battles with Dylan about NOT buying duplicates for a very long time. I have a memory of Dylan as a toddler clutching a video of Fireman Sam at a church bazaar while I tried to persuade him to put it back because he already had it. Although it must have been priced at less than 25p I didn’t see the point in buying Dylan something he already had and was prepared to tough this one out with him for the principle. I carried Dylan screaming from the church hall, telling myself the battle would be worthwhile as Dylan would learn that he couldn’t buy the same thing twice. Except he didn’t. There have been many incidents since. In shops, at charity stalls and in libraries, for nearly 20 years, I have been saying: No Dylan put it back: we’re not doing the two’s. I have repeated my explanation to shop keepers and stall holders repeatedly: Dylan doesn’t understand – he picks up objects because he recognises them – he has one of those already. No we don’t want to buy it thank you very much. Except that Dylan did. Only recently have I realised just how passionately Dylan wanted to buy all the duplicate items I have refused him over the years. In the new year, while Dylan was in overnight respite and I was having work done on his bedroom window frames, I took the opportunity to spring clean the room. 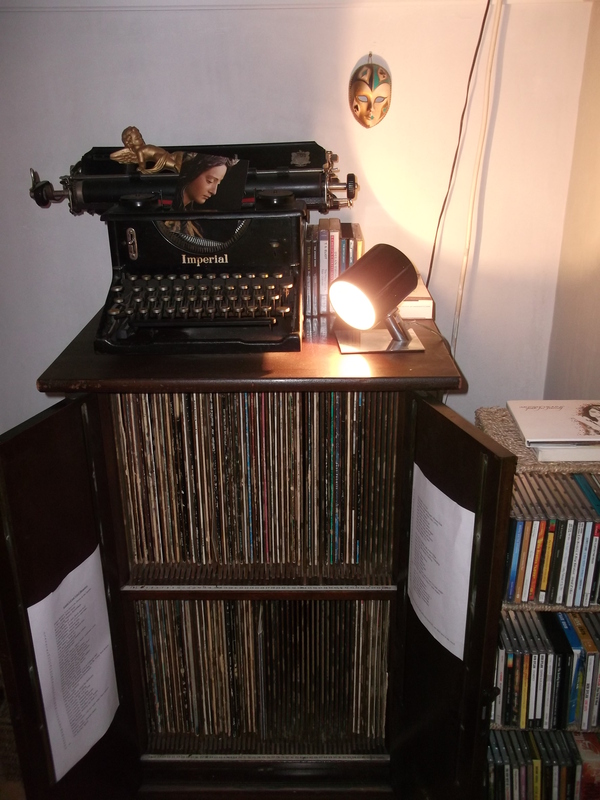 Dylan is tidy; he keeps his bedroom neat and all his books, DVDs and Videos are in a particular order on his shelves. He knows where everything is. If I move something, or suggest a change in how his things are arranged, Dylan will usually move them straight back. Occasionally he will accept a minor suggestion, however, and he seems to like it when I do a major reorganisation of his room. As is common with autism, it’s the slight alterations to order that can be difficult for Dylan rather than the big changes. On this particular day I moved the bed from one wall to another, involving a switch with some book shelves. 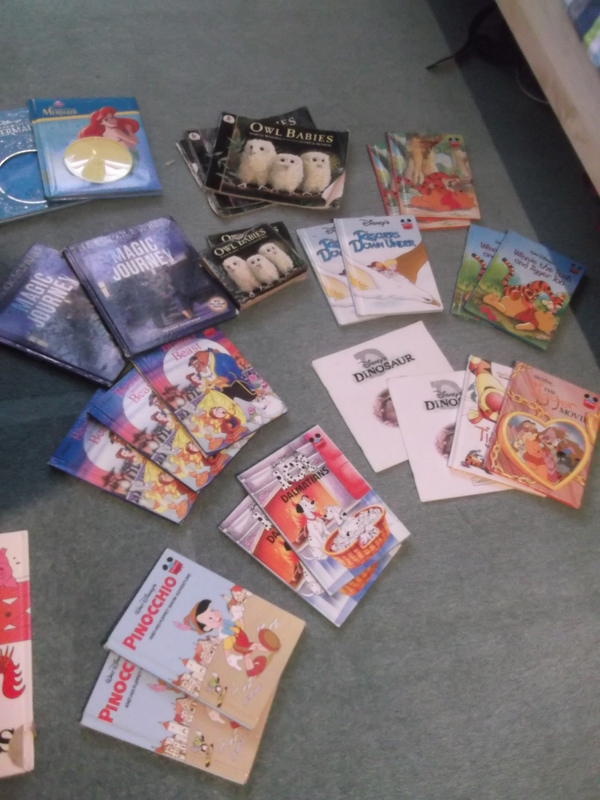 While cleaning up I decided to look through the books to see if there were any I could persuade Dylan to take to the charity shop. I was shocked by what I discovered. As you can see, Dylan has been Doing the Two’s pretty effectively (and sometimes Doing the Three’s). I was surprised that Dylan had managed to get duplicate copies of books but even more shocked by the systematic nature of these acquisitions. 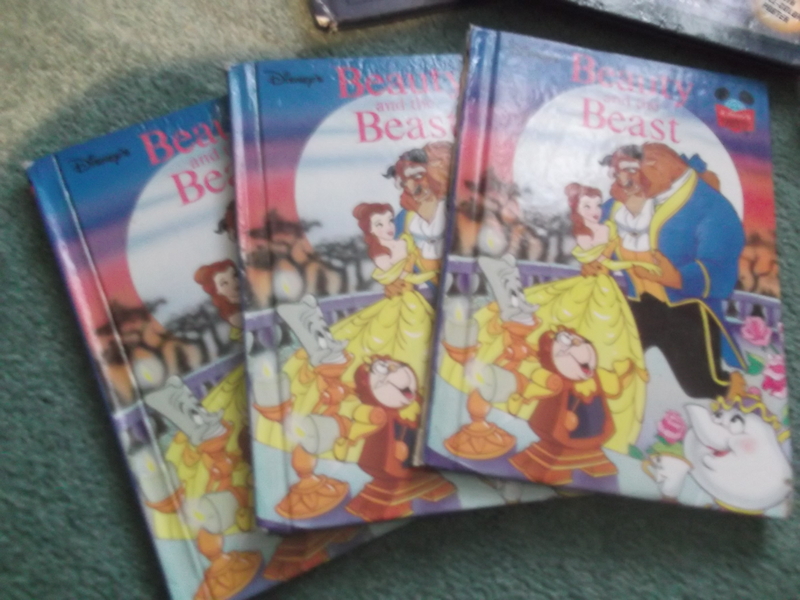 As I spread them out on his carpet I realised that there was a pattern to his acquisition: they were Disney books, primarily, and they were from particular book series’. One of the reasons I hadn’t noticed the duplicates before is that Dylan doesn’t keep them together but rather has a system for spreading them across his shelves. This isn’t by publisher (i.e. series type) or title (i.e. 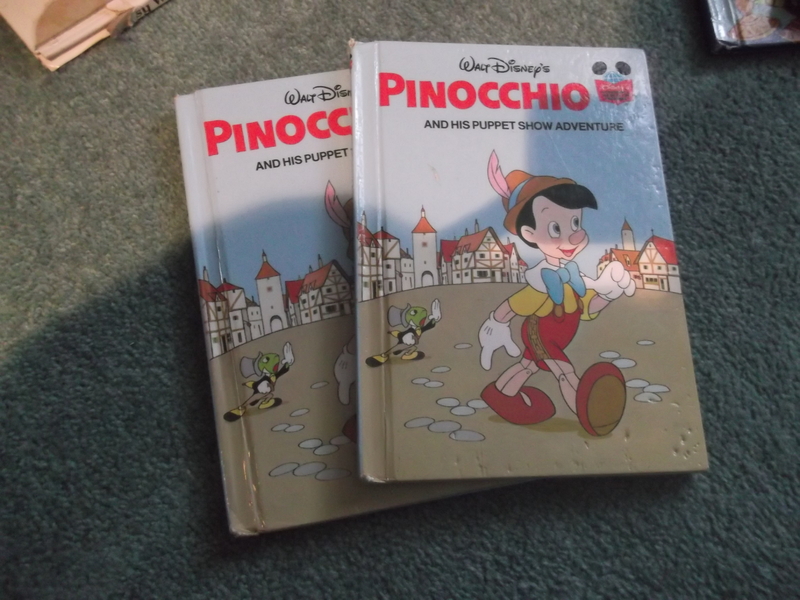 all Pinocchio’s together) but seems to be by some other classification system which Dylan has developed. The fact that there was an organising principle to Dylan’s Doing the Two’s turned it from simple acquisition to collection. My son, I realised, was a book collector. As I sat flabbergasted on his floor another realisation hit me. I hadn’t bought these books for him; in fact I had been the one thwarting Dylan’s book collecting activity. So where had he got these books from? I leafed through the books. They weren’t library books. Some of them looked worryingly like brand new copies. Others were torn and raggedy and written in. I found a girl’s name inscribed in one of them: This book belongs to Emily. Oh dear. With rising suspicion I remembered how, a couple of nights before, Dylan had arrived home from his new Day Centre and scuttled straight upstairs with his pack on his back, instead of leaving it in the room for me to read his home-school liaison book. Could my son be a book thief? I’m pretty sure that Dylan must have been collecting books either from his Day Centre or from his Respite provider, both of which have small libraries. Perhaps some of the books were taken from school before he left last summer. I’ve no idea how long the collecting might have been going on. I’m fairly certain Dylan hasn’t been taking books from shops – not while in my care anyway. But Dylan is like lightening; if there’s something motivates him, Dylan has thought about, planned and executed it before you can say Peter Pan. Like my son’s, my duplicates seem to involve books. If I look at my motivation for acquiring second copies of something, with the exception of the third item in the list (i.e. error), it seems to be love – though often love is coupled with a fear that the thing I love may be broken or lost. That reminds me of a dolphin beanie baby called Echo which my daughter loved best of all her collection. One day Echo was lost. My daughter was heart-broken. We told her Echo would turn up again – he would be somewhere. But he didn’t and my daughter continued to be miserable. One day my husband and I agreed that we would buy another Echo. We placed it with my daughter’s toys for her to find the next day. I think my daughter was a bit suspicious; Echo looked unusually clean. But she was satisfied until one day, playing with Dylan’s garage, the original dolphin was discovered in the car wash. I can’t remember quite what white lie we created but whatever it was seemed to satisfy and the dolphins became firm favourites: Echo 1 and Echo 2. Might Dylan, perhaps, collect duplicate copies of his favourite books through fear of loss? Or does he collect duplicates of his favourite books in the way I obsessively collect Plath’s Bell Jar in different jackets? Certainly, Dylan’s collecting across series’ seems to suggest an interest in variety as well as duplication. Many years after she had stopped playing with Echo 1 and Echo 2 my daughter pointed out to me (when I was flirting with the idea of an asymmetric haircut) that it is symmetry which underpins beauty; our aesthetic sensibility finds balance pleasing. Such structures also link mathematics and music, two fields which can attract autistic people. What if Dylan’s book collection represents an interest in symmetry and pattern? If so, could that interest extend beyond a book collection to other doublings? Might it explain the way Dylan walks twice around a tree? Could Doing the Two’s be about imposing symmetry on a life? Whether the explanation is to be found in fear of loss, love of order, a ghost twin or something else, if Doing the Two’s doubles Dylan’s happiness I can accept two Stings.